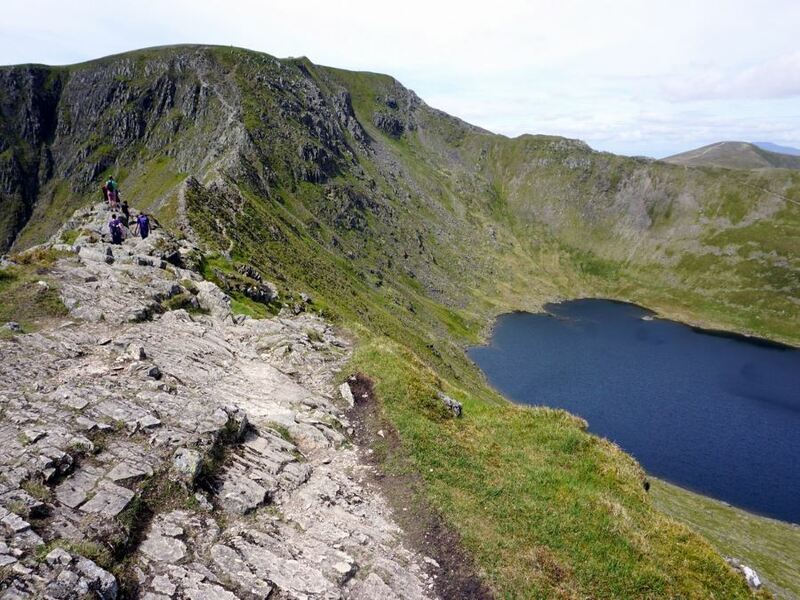 The walk up Helvellyn is one of the classics of the Lake District. 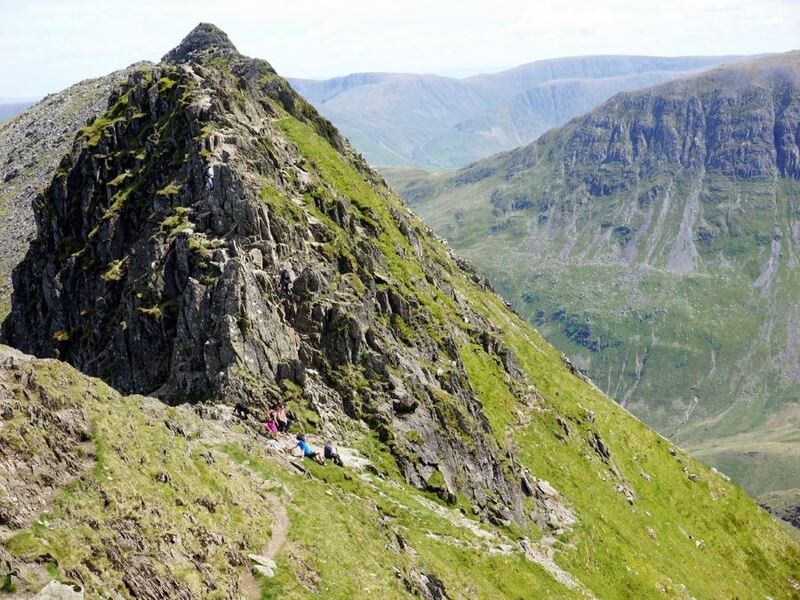 Those who don't like heights or using their hands may not be huge fans however, as it takes the scrambly Striding Edge on the way up and Swirral Edge on the way down. Get yourself to the beautiful town of Glenridding and park in the main parking lot, by the tourist information office. Parking is paid here, but there is good shade and a cafe near the parking lot if you need refreshment at the end of the walk. 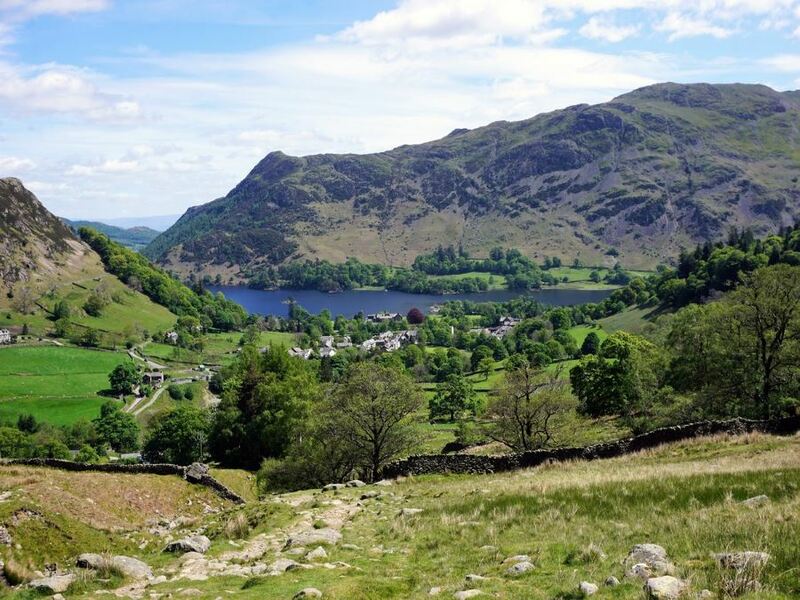 From the Glenridding Tourist Information Centre, ascend to the elevated section of the car park and take the path that goes to the right of NHS health centre.  You come out on a lane and turn left onto Greenside Road, heading uphill. You will soon pass the Travellers Rest pub, which is a good stop for a drink on the way back. As you head uphill (roughly 435m after starting) the road you are on splits. Go left on a road, signed for Hillside Farm and don’t take the tarmac lane going right (this road is a private road to get to YHA Helvellyn). Pass over a bridge and continue uphill, soon taking a rocky track leading off to the right, along a stonewall. 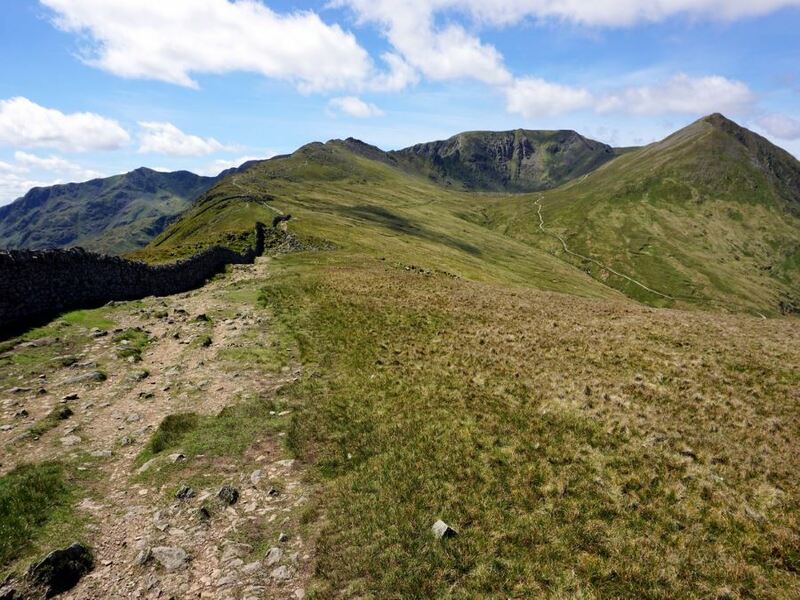 The path soon splits, take the left hand path signed to Helvellyn via Miresbeck, which is listed as 4.8km. In 90m the path reaches a stone wall where you need to head right on a broad path, continuing uphill before coming to another wall. 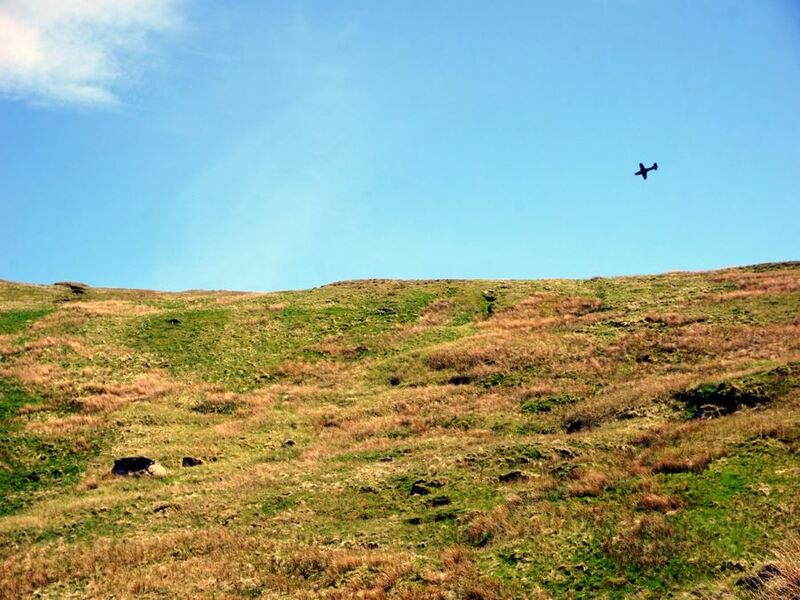 Stay to the right of the stonewall and continue uphill. At 1.1km from the start go through a gate set in a stonewall and immediately go left. Very soon you’ll be dropping down to cross the small Mires Beck (stream) and then following the Mires Beck uphill. 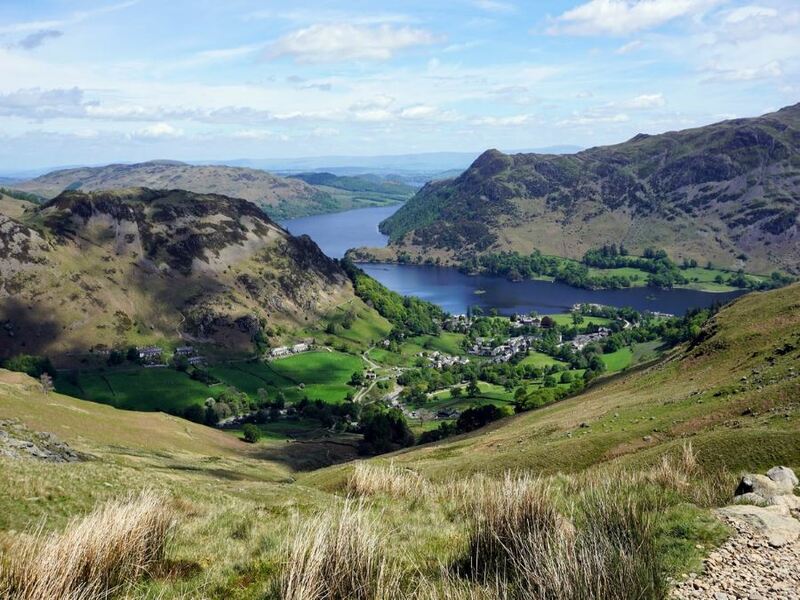 Look back for wonderful views of Glenridding and Ullswater. After passing the head of the stream the path curves around to the right, with a well-built stonewall on the left. At 3.0km crest the hill you’ve been climbing and see Helvellyn ahead. 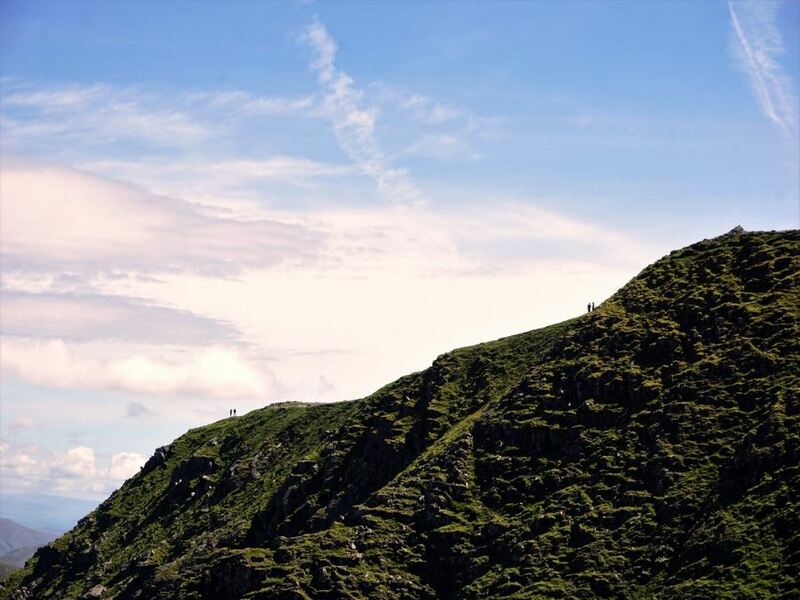 Striding Edge is the ridge on the left and Swirral Edge is the route you’ll come down on the right. 915m later the path splits. At this point if you don’t like exposure and scrambling go right and past Red Tarn and then up to Helvellyn via Swirral Edge. Swirral Edge still requires the use of hands and is pretty steep, but is easier than Striding Edge. 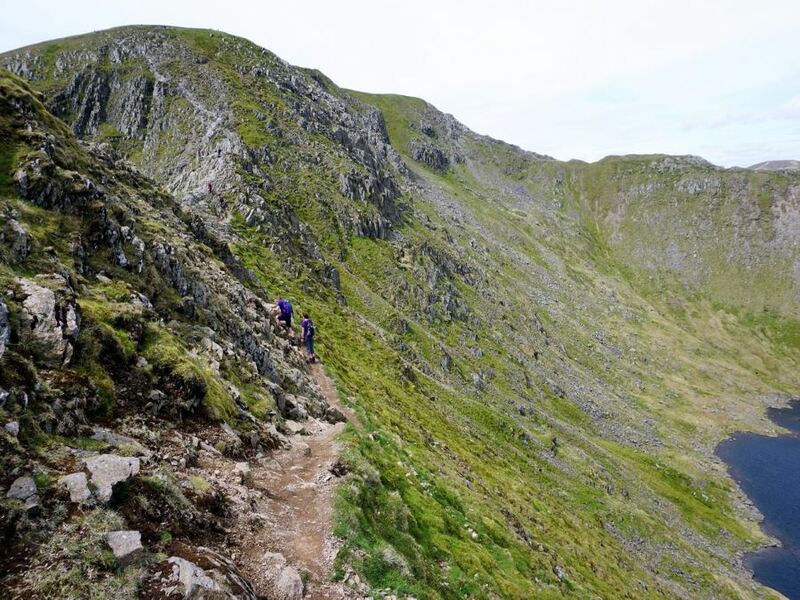 Most people go straight ahead for Striding Edge and you can see your path snaking up the left-hand ridge. From here it doesn’t even look too bad. 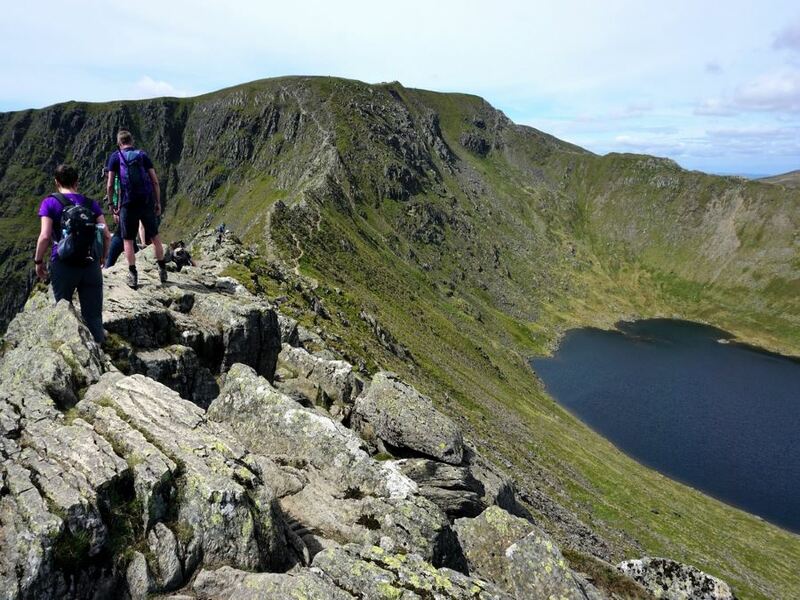 At 5.0km from starting you hit the Striding Edge ridge. As you start to ascend look for a path on the right if you don’t want to do the ridge. 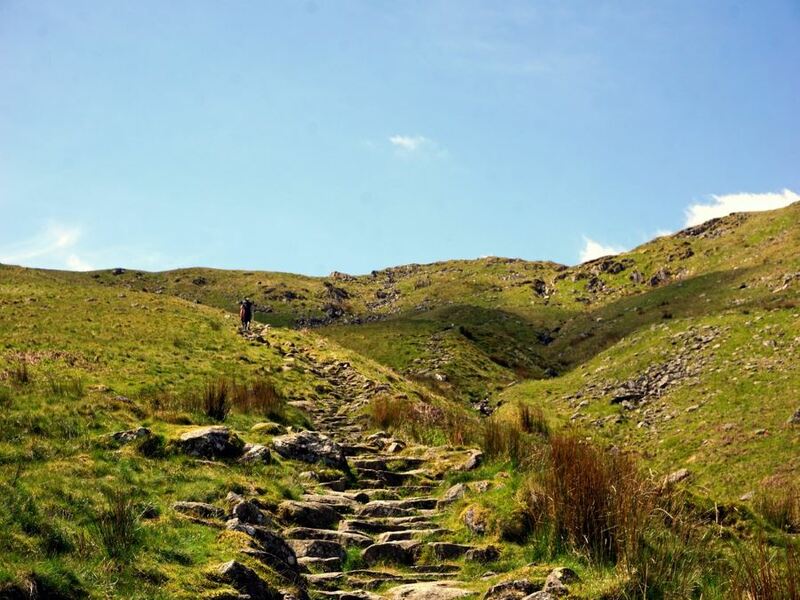 Note that the path is also exposed, though doesn’t have the same degree of difficulty as the ridge. Our map shows part of the route on the ridge and part on the easier path on bypass below. It’s worth noting that we regularly hear people telling their group that they are turning back from the ridge. This is an uncomfortable walk so if this isn’t for you or members of group then nearby Red Tarn is a great place to take a break while others in the group continue. At end of ridge there is a tricky bit that you need to down-climb before the final push to the summit. There is no easy way to do this, some people go down on their bum and others face in and down-climb this route. There can be line ups at this point when it is crowded. 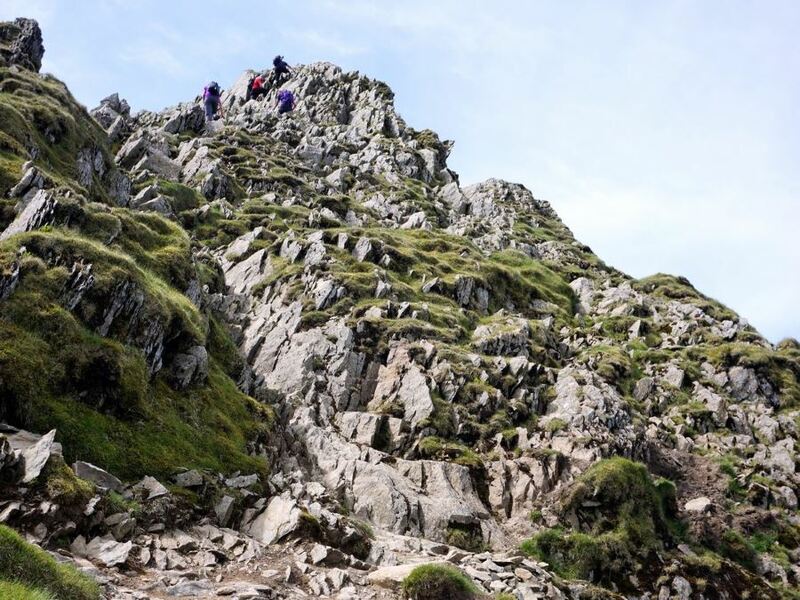 While the tough bit of Striding Edge is done, the final push to the summit is very steep and you will need to use your hands. Near the top, the path splits and you need to continue on the right. 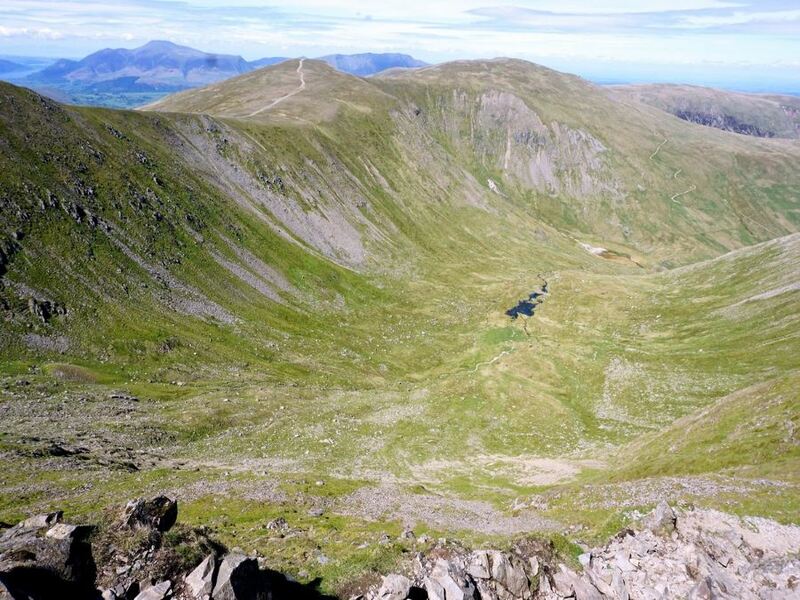 From the summit there are a lot of options for getting down, however many people like to go down via Swirral Edge. Going down Swirral Edge is less strenuous than Striding Edge, but it is still not easy. 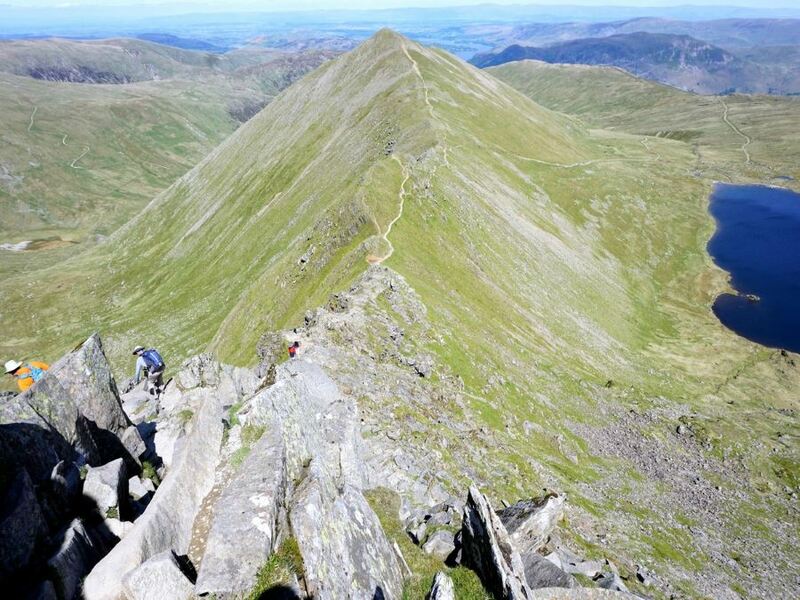 In fact, we have seen people going up Swirral Edge on all fours, however this is an exception. After getting down Swirral Edge, at 6.8km from start the path splits. We like to go left over Catsycam, however if you’ve had enough go right for an easier way down in valley, passing close to Red Tarn. You continue from Red Tarn on the left-hand path down the valley. Going up over Catsycam you’ll also get nice views. From the top of Catsycam the path heads down to your right along a path that is not as clear as the path the way up was. When you hit the main path go left and head down the valley. Roughly a 1.6km after getting on the main path, you pass over a pair of bridges and continue on the trail. 460m afterwards the path splits again. Here you can take either path as they re-join in a few minutes. Soon afterwards you will notice there is a bridge on your left crossing Glenridding Beck. You can cross over this bridge if you are staying at YHA Helvellyn or want to walk on the road back to Glenridding, however we prefer to stay on this side of the stream. 180m after the bridge the path splits. Take the lower left-hand path, though if you take the right upper path you have two down paths that will reconnect later to the path you are on. At 11.7km from start you re-join the path you took at the start of the day at a gate between a stonewall. Go through the gate and downhill. In 230m you pass another gate and go left continuing downhill. When you come to the road turn left and go over a bridge. When you get to the next road, turn right and continue downhill to the car park. Remember to turn right at the NHS health centre. You can get to Glenridding by taking the 508 Penrith to Windermere bus stops in Glenridding. The Inn on the Lake is a beautiful hotel in Glenridding.